The Holy Grail of computational chemistry is to accurately, precisely and routinely predict the binding potency of a potential drug molecule before it is made, and despite our best efforts (and the claims of some groups), this is not possible, yet. The fundamental physics governing the energy between a drug molecule and its partner in the body is so complicated that it can’t be calculated without several assumptions. For example, on the atomic scale, the wonderful world of quantum physics applies, but even with access to improved computational power, these calculations cannot be performed on a reasonable timescale, so we resort to physics from the time of Sir Isaac Newton. Another assumption is the change in disorder that occurs when a drug molecule binds to its site in the body. The universe is driven by an increase in disorder, but sometimes when a drug binds, the disorder decreases. Calculating this change in order requires knowledge of all the possible configurations, over time scales that could be as long as hours. We can only manage up to a few microseconds at best, for a single copy of the drug molecule; when you consider there are nearly 2,000,000,000,000,000,000,000 (that’s two sextillion) copies of the paracetamol molecule in a 500mg tablet, our assumptions about the change in order are probably inadequate. Having said all of this, it does appear that with lengthy calculations we can sometimes rank the similar potential drug molecules by their interacting energy well enough to decide whether to synthesise the best ones. 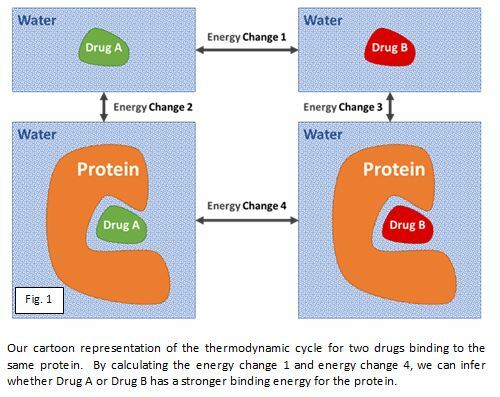 The figure below shows how computationally simulating the change of the molecule, both in the protein and free in water, can rank order the binding energy of potential drug compounds. The key word is ‘sometimes’; roughly a third of the time they work quite well, another third they are ok-ish, and the final third doesn’t work at all. At Sygnature Discovery we have initiated a collaboration with a leading academic expert in this field to explore possible explanations for when this approach is accurate and when it breaks down, so we can then develop computational solutions to improve the accuracy. Of particular interest is the ability of these techniques to predict scaffold hopping opportunities, since this often provides significant breakthroughs in project progress at the expense a greater synthetic chemistry investment. This will benefit the discovery and optimisation of drugs by improving the quality of compounds synthesised and reducing timelines and costs. The search for computational chemistry’s Holy Grail continues, and perhaps we are moving a step closer with these techniques, and an understanding of the systems on which they will have the most impact.